As Adam Drucker (the artist better known as Doseone) recalls his main reason for beginning his love affair with hip-hop, he commemorates his belief that "people sounded like they knew what they were talking about." However, he's also acutely aware that hip-hop now needs to start acting its age and not its vinyl size. For too long hip-hop and the media that repots on it have been seesawing between adolescent imbecility and a mid-life crisis. While those in the know recognize Doseone as one of the most important and exciting artists in hip-hop today, most are only interested in accusing him of being the gay rapper - thanks solely to a Vibe photo depicting him wearing Rainbo Brite leg warmers while walking his cat on a lead. And while Dose has released many critically acclaimed albums since 1998, few people are aware of his confrontation with Eminem at Scribblejam four years ago. By all accounts that incident was more of a debacle than the Bush/Gore election - especially when the then unknown Mathers tried to win by passing off verses from his unreleased 'The Slim Shady EP' and regurgitated chunks from his 'Infinite' album as freestyles. Reflecting on this acidulous experience, Drucker sighs: "Most people cheat. The only guys I've met who don't are Project Blowed - they've rapped enough to be very good at freestyle. Most other guys are so studio that all they do is slightly modify their hit single. That's so frustrating." Now UK label has picked up the cLOUDDEAD album, Dose is far more upbeat and circumspect. "We get scrutinized for being abstract hip-hop in the States, but in the UK the only thing you can do is do things differently, so it's interesting to hear how these guys have a license to do abstract hip-hop." 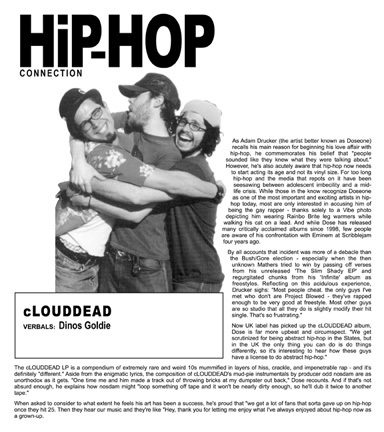 The cLOUDDEAD LP is a compendium of extremely rare and weird 10's mummified in layers of hiss, crackle, and impenetrable rap - and it's definitely "different." Aside from the enigmatic lyrics, the composition of cLOUDDEAD's mud-pie instrumentals by producer odd nosdam are as unorthodox as it gets. "One time me and him made a track out of throwing bricks at my dumpster out back," Dose recounts. And if that's not absurd enough, he explains how nosdam might "loop something off tape and it won't be nearly dirty enough, so he'll dub it twice to another tape." When asked to consider to what extent he feels his art has been a success, he's proud that "we get a lot of fans that sorta gave up on hip-hop once they hit 25. Then they hear our music and they're like "Hey, thank you for letting me enjoy what I've always enjoyed about hip-hop now as a grown-up.